Sometimes I find inspiration in unusual places. 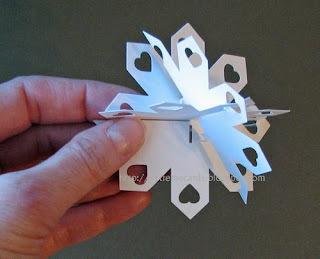 The template for this lacy snowflake came from the Phlat Printer forum. But it's ridiculously delicate when cut from paper rather than foam or wood. I borrowed the slot design for a somewhat sturdier snowflake. 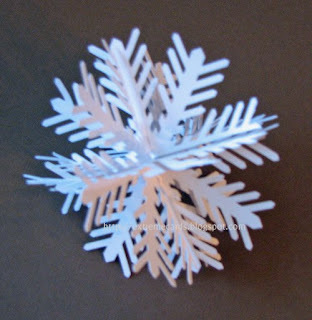 Unlike the sliceform version I made last week, this snowflake does not fold flat. 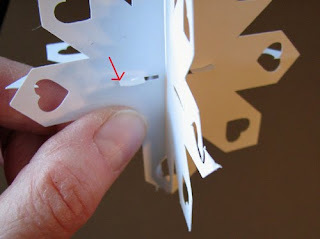 The advantage of the slotted snowflake is that it doesn't have to hang. When set on a flat surface it doesn't collapse! 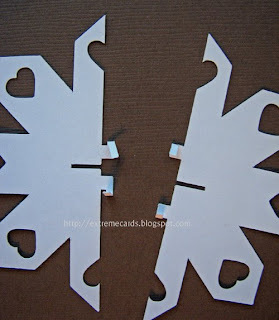 Download and cut out snowflake pieces. 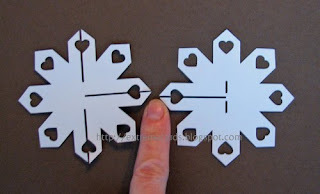 Lay out the two whole snowflakes and slide together the center slots. 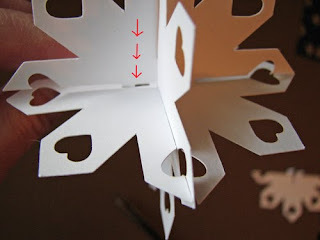 Fold in the tabs on the half snowflakes. These tabs will be inserted through the rectangular slots on the one whole snowflake. 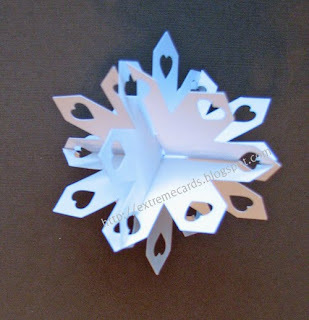 Slot one half snowflake onto one whole snowflake. Work the tabs through the slots. I use two pairs of tweezers to push from one side and grab from the other. 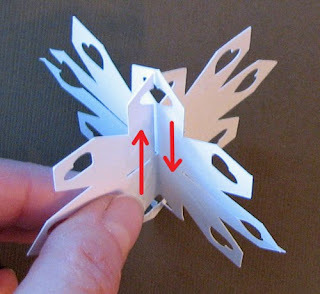 Unfold the tabs to lock the half snowflake in place. Now slot the other snowflake half in place. Work the tabs through the same slots. This will probably take a couple tries as one side tends to pop out was you work the other side in. Unfold the tabs.